With more rain forecast over the Ko'olau Range, I headed to the drier, sunnier side of the island at Makaha. Ryan came with me, intending to run, fish and do beachy sort of things while I trampsed about in the grassy hills. It was raining on both sides of the H3 tunnel through the Ko'olau Range but by the time we got on the H1 heading west it was almost all blue skies. Temps would be in the 80s for much of the hiking, on the warm side, but once above about 1,500ft there was a fine breeze that helped keeps things quite nice for the upper elevations. This is one of the highpoints in the Makua Kea'au Forest Reserve which lies between the Kea'au Valley to the north and the Makaha Valley to the south. The summit lies only a few miles from the coast, but rises to an elevation of 2,650ft, a fairly steep climb. There is no maintained trail on the route, but one can find a use trail in places, more often used by the feral goats that graze the slopes on either side than by people. The cross-country travel is pretty easy along the grassy ridge which does not become more heavily vegetated until sometime after the summit. Other TRs describe hiking further to two additional summits, but those may more easily be reached by another route from Kea'au Valley (in any event, I planned to make a second outing to those later in the week). I also read reports of bushwhacking in the beginning of the hike to reach an old road which switchbacks partway up the initial slope. I found that completely unnecessary, starting instead from the Makaha Beach Park parking lot on the east side of the highway and simply heading through the tall grass to the ridge. It makes for some decent scrambling, first up to a point with a flag depicting a pink breast cancer ribbon with a bunch of names on it (survivors? ), then to a pair of old WWII pillboxes overlooking the coast. An old winch powered by a gasoline engine is found just below these, perhaps used to bring supplies and personnel up the hill. The only other folks I found on the route were a few local teens heading down from the pillboxes, one of them carrying a BB gun. The ridge reaches a highpoint at Pt. 1,429ft before dropping a few hundred feet and resuming the climb. 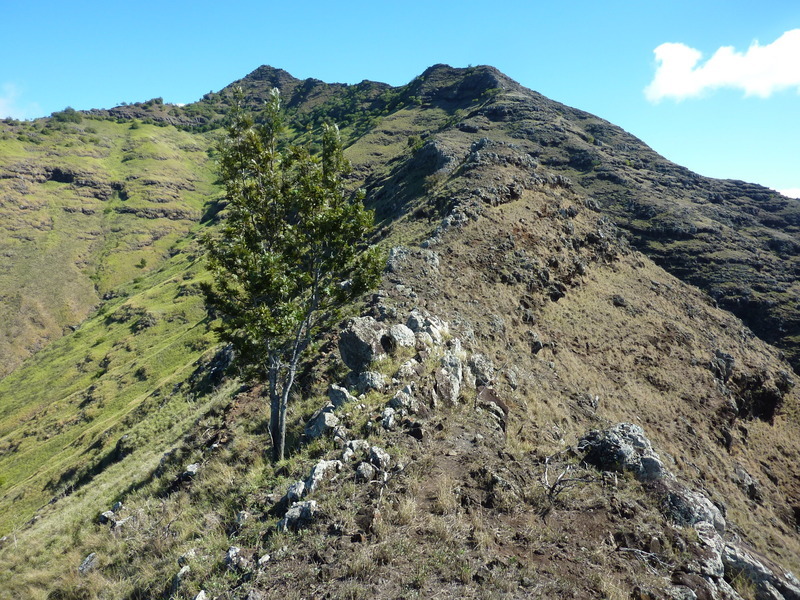 The views from the ridge are quite fine, looking up and down the coast as well as inland to the higher summits of the Wai'anae Range, and only seem to get better the higher you go. It took me a little under 2hrs at a moderate pace to reach the summit. It was so lovely up there taking in the views with a cool breeze blowing that I did something I rarely do - sit a spell. After about 30min of lying about, I picked up my things and started back down. I took a shorter, steeper route down Water Tank Ridge. The ridge goes at class 2-3, nothing really hard, dropping to a pair of city water tanks and then Kili Rd which leads back to the highway. I found a surprising amount of trash on this route, picking up what I could and stashing it in my pack, pockets and carrying it in a small bundle in my hands. Seems the rock outcrops above the water tanks may be semi-popular with some of the local teens to hang out and party. I walked back along Kili Rd (which sadly is used by others as a local dumping ground on either side of the road) to the highway and turned north to return to the park I'd started at. Ryan came driving by when I was less than 100yds from the parking lot - he'd taken the Jeep for a drive and was getting back a little after our 2p meeting time, but perfect timing as it turned out.